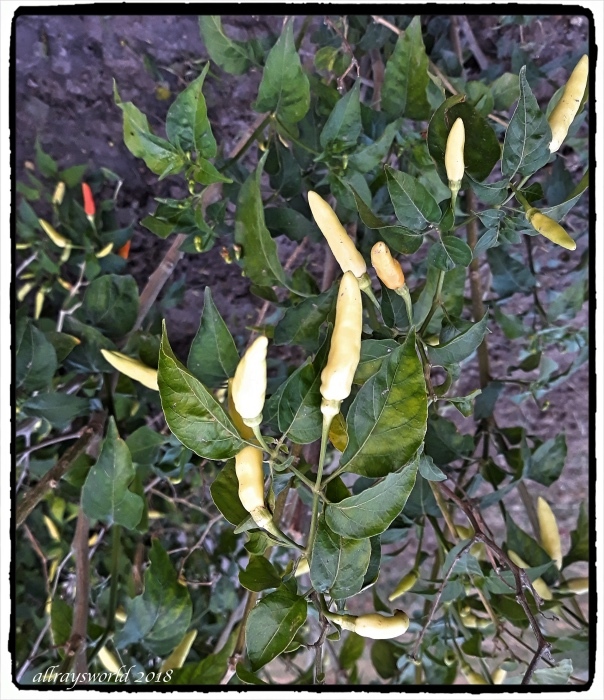 Na's Chilli patch seems to flower and fruit continuously, and the plants are potent for several years. really liking the focus point here, Ray. Ray: I find the flowers attractive, Elizabeth. J'aime le piment. C'est la première fois que j'en vois les fleurs. Ray: Les plantes peuvent être assez attrayantes pour figurer comme des décorations de plantes en pot autour de la maison, Martine. And I guess you are a chilli fan, Ray? I can eat a meal without chillis, but admit to using them in most meals. They look healthy, and no doubt hot stuff! Ray: They are hot enough to make the nostril hairs think they have been singed, Chris. flower and fruit at the same time - this is the paradise! Ray: In this climate many plants fruit and flower continuously, Philine...it amazes me! Piment très fort surement ? Ray: Oui ... Les piments thaïlandais sont très épicés, Claudine ... J'ai l'habitude de les consommer maintenant, mais j'ai eu quelques épisodes douloureux quand je suis arrivé en Thaïlande. Sounds like bliss for photographic opportunities. I've never knowingly had a chilli. Ah.. no, I was tricked into having a chocolate brownie which had chilli in it. Ray: Chilli is wonderful...we eat it at almost every meal, Alan. Grow your own chilliest, isn’t that wonderful. You are so lucky Ray. Ray: Our garden has many delights, Chad. Ray: Na is getting better at this all the time, Bill. I guess Na grows an assortment if the has a special Chilli patch. I had a look at the spec of your NMax, I'd like one of those, it looks a good machine. Ray: Na's garden provides many fruits and veggies, Brian, and something from the garden is present at every meal. The NMax is a fine little vehicle...seems well constructed, and has enough power for our needs. Ray: The garden is excellent, Anne, and quite big enough for us to grow most of our needs. Ray: Chillis grow, and produce, all year, Tom...very convenient for the chef.